Discussion in 'Introductions' started by Vitaful Mike, Jul 18, 2018. I'm a casual collector for the PS Vita. Nice to see a forum with its fans so dedicated to the aging console. I purchased my Vita in 2013 and started building my collection mid-2017 (better late than never). Roscoe Jones, rajat, Terramax and 5 others like this. Thanks for joining the family Mike! It's great to have you with us. Welcome to our Vita family! PS: watch out for VITAGIRL, everyday is her time of the month. To be forewarned is forearmed, that's my motto. Thank you all for the warm welcome. And thanks for the heads up Fanny . How do I change the profile picture? Everytime I click on the blank Avatar, it says I don't have the permission to perform this action. I'm guessing that I need to be at a certain level to do that. Heads up, Heads down, just head basically, it's all good. Welcome Mike. Great to have new members. Hope you enjoy your stay! It's been a few since I joined, but possibly you need to have so many posts first. I know the buy/sell/trade forum was locked out until I was on the site for a minute and had so many posts. Looks like it's time to build up my post count then. You need 3 posts and 1 like in order to upload an avatar, so you should be able to do it now Mike. Thanks Retro8bit, the option to swap Avatar is now available. Retro8bit and sean like this. Your screen name reminds me of Viewtiful Joe A good game if you've never played it! Vitaful Mike, zodaex and sean like this. Hello there. If you are interested in HellDiving, pm me. 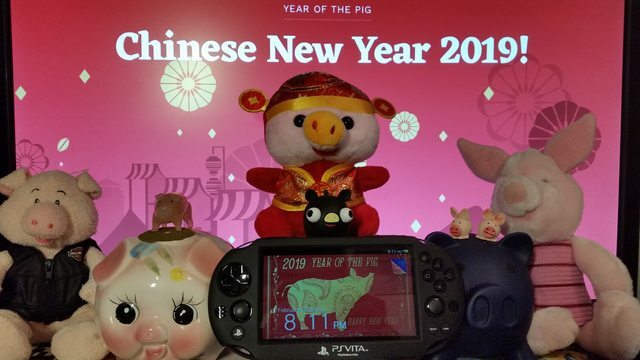 Happy Lunar New Year to you all Vita Loungers! Welcome to the Year of the chivalrous Pig! Linkx41, zodaex, DojoDan and 1 other person like this.